Rochester shipwreck explorers Jim Kennard and Dan Scoville have announced the discovery of yet another sunken ship in southern Lake Ontario, off of Oak Orchard Harbor. A 19th century schooner sunk in 1862, the C. Reeve, was discovered by the men in late summer after a search effort which took them more than five years. Finding the ship was a lucky discovery, the men said Tuesday. The initial discovery was not made by the conventional search methods used by the team to discover many of Lake Ontario's shipwrecks, they said. The Reeve is a two-masted gaff rigged schooner built in 1853 in Buffalo by the firm of J.B. and N. Jones. 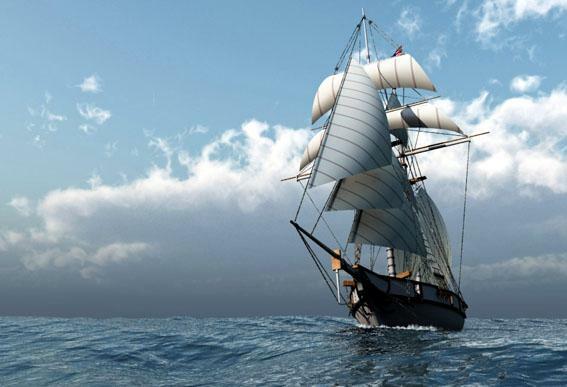 In July of 1858, the schooner made a trans-Atlantic crossing, sailing from Detroit to Liverpool, England, with a cargo of black walnut lumber. In October, she returned with a full load of crockery. The Reeve is the 14th discovery for Kennard and Scoville between Lake Ontario and the Finger Lakes. Kennard said they have already discovered a few more shipwrecks in Lake Ontario, which they have not yet announced. In an e-mail Monday afternoon, Kennard said as they were eating, a light wind was pushing the boat along when Scoville looked at the depth recorder and could see they were going over something that was several feet off the bottom. Since one of the masts of the Reeve is still standing, the recorder jumped up, momentarily showing something 75 feet off the bottom.